W’ dae b’ wae indishnikaaz, Ojibwe Anishinaabe indaaw, Mukwa indoodem. 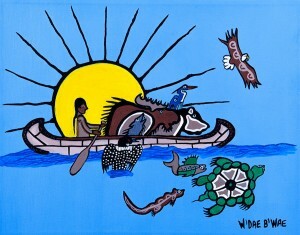 My name is W’ dae b’ wae (“Speaks Truth”), I am Ojibwe Anishinaabe, Bear is my clan. Mike’s prints are now available for only $20 from Pass The Feather!! Order Here only until Dec. 20th! Please click the images to see a full view. I am very proud of my Anishnaabe heritage. 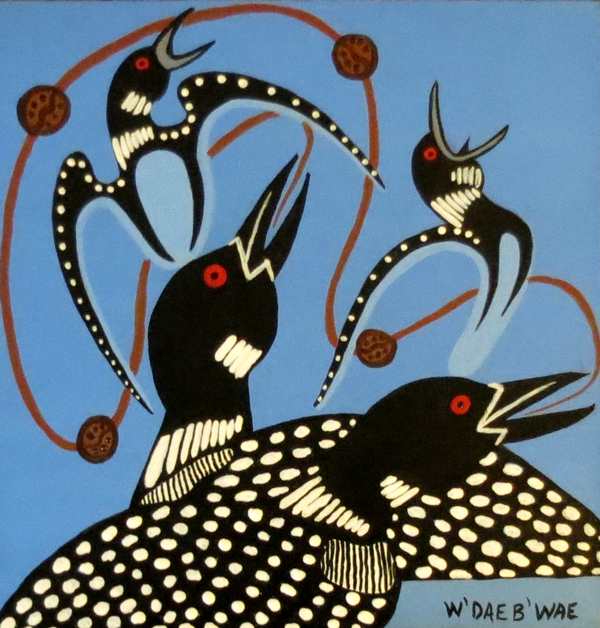 I was very fortunate to have Art Solomon, an Anishinaabe Elder, as one of my teachers. Art gave me my name. I sign my work as W’ DAE B’ WAE. I hope my art speaks to the truth, telling the stories of the Anishinaabe, sharing the culture and traditions. But the truth in my art may also be different for others. What I see in my art may differ from what others see….my art may speak to them differently. I have a background in education (mainly environmental science and outdoor education) as well as in the social services field. In addition, I have been involved with several youth canoe building projects. In 2012, I went to Fort Severn (on Hudson’s Bay) to help conduct a month long workshop in the restoration of wood canvas Freighter canoes, with the local First Nations youth, which was featured on CBC’s The National (see http://www.cbc.ca/news/canada/story/2012/04/27/f-fort-severn-canoe-restoration.html). Though my work in Fort Severn was supposed to be restoring Freighter canoes, it involved much more, especially after the project was extended through the entire summer. 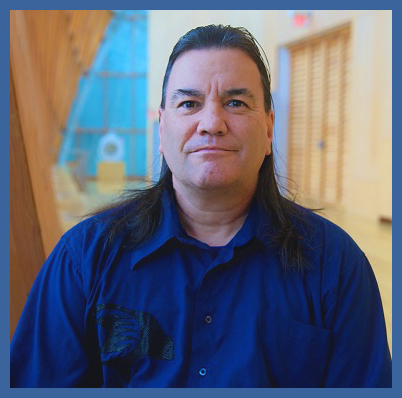 Besides the work on canoes, this experience awoke my desire to contribute in a positive way, with all I had gained while doing social service work and as an educator, as well as through traditional teachings. Since I am of the Bear clan, I suppose one could say that the bear came out of hibernation. I returned to my artistic roots, since I learned much about my Anishinaabe culture and traditions through art….as well as being able to share such knowledge with others. I started W’ DAE B’ WAE Creative Arts (http://4nishart.wordpress.com/). For a number of reasons, I didn’t know anything about my Native heritage until I was in my late teens. Suffice to say that ‘DENIAL’ was not a river in Egypt in my family. Though I didn’t grow up in the culture (or on the reserve), eventually I did get very involved in my culture, especially in following the traditions. I had to accept that I was half white and half red….two parts of the four Sacred Colours….of the four Sacred Nations of Man. Native people sometimes wear what is called a Unity button, with the four colours of red, white, black and yellow on it; these colours all meet in the middle. So my path started there in that middle place. Finding my balance between two canoes as it were. And for a while, you might be able to balance with one foot in each canoe. But you cannot stand with your feet in two canoes forever. No matter how hard you try. I soon realized I had to choose which canoe I was in. So I chose to follow my Anishinaabe heritage. To embrace my Anishinaabe traditions and teachings. I believe all of those things I’ve learned….that I continue to learn…. and find each time I paddle out into wild places. Especially when surrounded by rocks, trees and water. Drew Hayden-Taylor once wrote he was half Ojibway, and half Caucasian, so he was forming a new race called the ‘Occasions’….and since he thought it up he must be a ‘Special Occasion’. That sort of describes where I am now. I feel very proud of my First Nations heritage….as well as my Irish Canadian roots. A Cree friend in Fort Severn said I must be ‘Ojiberish’. But I am honoured to be Anishnaabe….and to have learned some of our teachings. As for my background in the arts, I am a visual artist (mostly painting on canvas in acrylic, in First Nations/Native Woodland style). 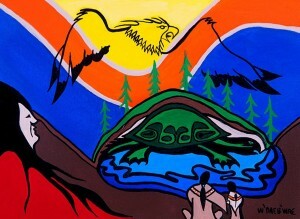 I am self taught largely and have been influenced by many other great Native artists such as Norval Morrisseau, Carl Ray, Michael Robinson, and Roy Thomas; and mentored by others such as Ken Syrette, Jay Bell Redbird, Joseph Sagij, Leland Bell, Phil Cote, Brian Marion, Robert Houle, LauraLee Harris, & especially Norman Knott, a cousin. I took individual art courses through Ontario College of Art and Design, Toronto Art School, and the Haliburton School for the Arts, for more formal training. I was quite involved with the Association for Native Development in the Performing and Visual Arts (ANDPVA), exhibiting at several of their shows, including acting as curator for their exhibitions at many Skydome Pow Wow. I worked with 7 Generation Image Makers when it was first formed, and have participated in many arts workshops with youth. Since returning after my hiatus as an artist, I have shown at the Liberty Village Art Crawl; Indigenous and Ingenious; Gchi Nbi Art For The Water Show, Trent University; Native Men’s Residence Pow Wow; Wasauksing Pow Wow; G’zaagin Art Gallery; Gravenhurst Dockside Arts Festival; Native Canadian Centre of Toronto Arts and Craft Show/Sale; Curve Lake Pow Wow; Biindigen Aboriginal Arts Festival (Georgina Arts Centre and Gallery); and was at the 2014 Spring One Of A Kind Show as part of the Thunderbird Marketplace. I have created logos for the Giiwedin Anang program (Aboriginal Legal Services Of Toronto) and Thunder Woman’s Healing Lodge, as well as a series of images for Cancer Care Ontario, Aboriginal Services, for use in pamphlets. Although my main artistic medium is visual art, I am also involved with carving (antler/bone, stone and wood); First Nations/Native traditional craftwork; canoe building; paddle making; cradle board making and other wood working including furniture making; writing/storytelling; film and photography. As a writer and storyteller, I have given readings at ANDPVA Writers’ Rooms. When I use my paint brush I understand that I am not the only one doing the painting even though my name goes on the finished work. It is not how I paint, it is what I paint that’s important. Painting from experience is good but so is painting based on one’s knowledge. I am a painter in the Ojibway Woodland style. This style uses symbolism and imagery inspired by the birch bark scrolls, pictographs and petroglyphs. The spirit of the art, from the culture and traditions, and from what my Elders have taught me, allow me to have the visions I need to have so I know what to paint. These visions compliment the strengths, values and traditions of my people, my family, my community and my nation. Through my artwork, I paint these visions of teachings so that they can be shared with others. The paint brush comes from the hair of an animal and the handle of the paintbrush comes from the tree so I like to acknowledge my relatives for their wisdom, for their part in the material of the spirit of the art. Being an artist completes my purpose in life. 1996-1997 Curator/Exhibitor at ANDPVA Art Show at Skydome Pow Wow. 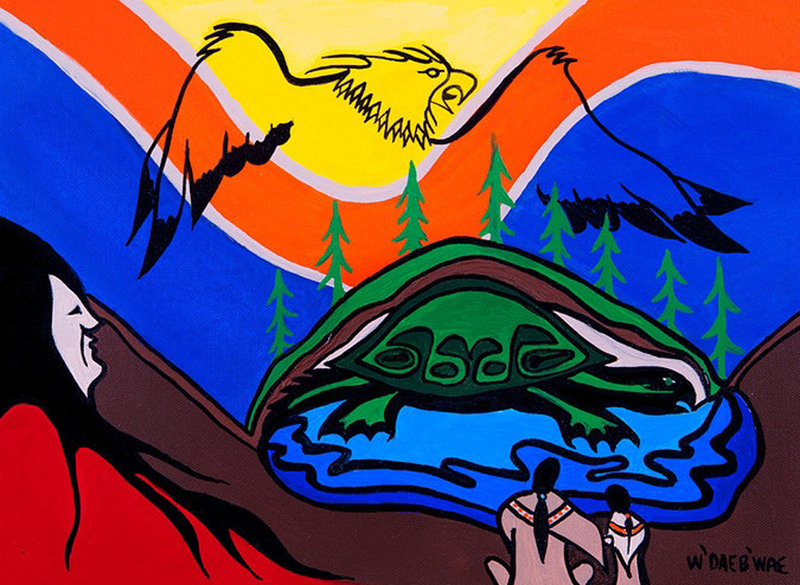 2000 Ontario Arts Council Grant (Aboriginal Artists in Education) Mural Project at Toronto First Nations School. 2013: Liberty Village Art Crawl; Curve Lake Pow Wow; Biindigen Aboriginal Arts Festival (Georgina Arts Centre and Gallery); Arts Exposed (Markham); Indigenous and Ingenious (Gladstone Hotel); Native Canadian Centre of Toronto Arts and Craft Show/Sale; Annex Gift Fair (Tranzac Club); Tea-N-Bannock Cafe; Artisans at Work Gallery. 2014: One Of A Kind Spring Show as part of Thunderbird Marketplace; Indigenous and Ingenious Show, Communication Gallery; Wasauksing Pow Wow; Gravenhurst Dockside Art Festival; Curve Lake Pow Wow; Biindigen Aboriginal Arts Festival (Georgina Arts Centre and Gallery); Native Canadian Centre of Toronto Arts and Craft Show/Sale. Designed logo for Aboriginal Legal Services of Toronto and Thunder Woman’s Healing Lodge; working on series of images for pamphlets for Cancer Care Ontario’s Aboriginal Programs. 2015 (so far): “The Canoe Art Project” at Todmorden Mills through Toronto Arts Council’s Animating Historic Sites (Lead Artist); “Reflections Naturally” joint art show (with Joseph Sagaj) at Georgina Arts Centre and Gallery; Curve Lake Pow Wow; several images for health promotion material for Cancer Care Ontario.